In February, 2018, a Texas-led coalition of 20 states sued the federal government claiming the Affordable Care Act is unconstitutional in its entirety. The states argued that after Congress in December 2017 gutted one of its major provisions, a financial penalty for not having health insurance, known as the “individual mandate,” the rest of the law became unconstitutional. In June, 2018, the US Department of Justice announced it would not defend the suit, which prompted a counter-coalition of states, led by California, to step in to defend the law. In the Brief, the Trump Administration, while refusing to defend, had agreed the individual mandate was unconstitutional, but argued this only invalidated the ACA’s preexisting condition protections and not the remainder of the ACA. This was ironic, indeed, because the part of the ACA with the most public popularity is the part protecting preexisting conditions. Attorney General Jeff Sessions pointed out he had made the not-to-defend decision after conferring with the President. In December, Judge Reed O’Connor, of the 5th Circuit Court, ruled in favor of the Texas coalition and declared the entire Affordable Care Act unconstitutional. Very few legal scholars, make that nearly none, thought Judge O’Connor’s ruling would stand. Many died-in-the-wool conservatives, make that nearly all, thought the same. We wrote about this in a “Dog Catches The Bus. Now What?” post. So, in two sentences, the DOJ went from everything in the ACA, except the preexisting conditions part, is constitutional, to everything is unconstitutional. Reaction in Republican circles has not exactly been one of untold delight. In fact, so far, it’s been as quiet as midnight in Death Valley. So, what was William Barr thinking and why did his minions send the midnight missive? Here’s a thought. Since most of the heavy money is on Judge O’Connor’s ruling being overturned somewhere along Appellate Way, could the DOJ have sent its billet doux with the intention of showing its ultra-conservative allies that it’s with them all the way, while all the while realizing it will never have to put the ACA toothpaste back in the tube? Think about it. After all, you have to admit it’s easier to think about that than about what will happen if O’Connor’s ruling becomes the law of the land. And start the healthcare war all over again! Posted in Misc. | Comments Off on After Catching Bus, Dog Still Doesn’t Know What To Do. But The Bus Just Got Bigger! In 2013, Oxford professors Carl Frey and Michael Osborne published what became a highly read, highly cited and highly criticized study suggesting that machines could replace 47% of America’s jobs over the following 25 years. This landed like a stink bomb on the robotic revolution. Following the study, academics and pundits jumped into the middle of the debate to argue its conclusions. 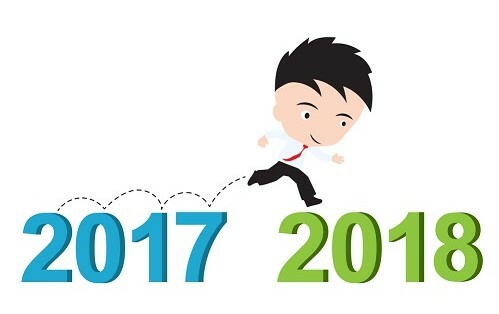 In 2015, Forrester Research’s J. P. Gownder authored The Future Of Jobs, 2025: Working Side By Side With Robots and updated it two years later in 2017. Gownder concludes that, yes, AI will replace many jobs, but it will also create many jobs. He suggests a net job loss of perhaps 9.1 million, or about 7% of the workforce. Seven percent isn’t 47%, but 9.1 million jobs are a lot of jobs. And a lot of people who could be swept away by the rise of the robots. So, clearly, the robots are coming. And, just as clearly, there is now, and will continue to be, human collateral damage. We should do everything in our power to help the millions of people the robots will displace. It would be outrageously stupid, and immoral as well, not to do that. 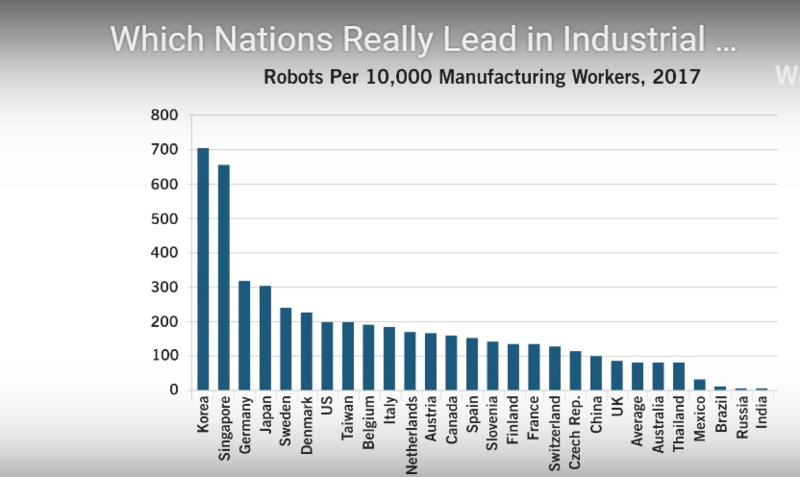 But if you believe development and adoption of robots is essential to keep the country competitive and prosperous, then you should be concerned, because other countries are outpacing us. By long shot. A new report from the Information Technology & Innovation Foundation (ITIF) finds the US ranks 7th in the world in the rate of robot adoption in the manufacturing sector. When controlling for worker pay, the situation is even more bleak. In that case, we’re 17th in the world. The report relies on International Federation of Robots data for industrial robot adoption rates but adjusted the rankings to control for differences in manufacturing worker pay. The decision to use robots usually weighs the cost savings that can be achieved when a robot can perform a task instead of a human worker, and those cost savings are positively related to the worker compensation levels. Higher wages lead to faster payback, making more robots a more economical investment. 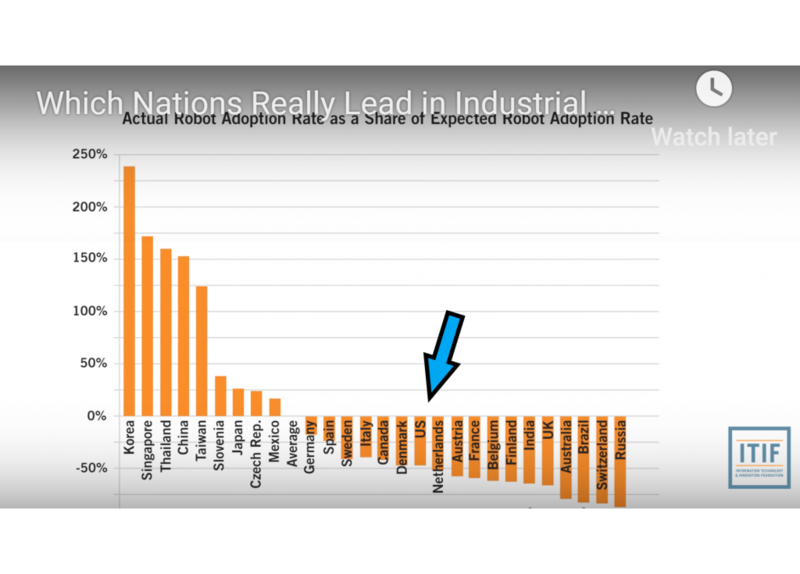 On a compensation-adjusted basis, the report found that southeast Asian nations significantly outperform the rest of the world in robot adoption, with South Korea, Singapore, Thailand, China, and Taiwan the top five nations, in that order. Moreover, China’s rate of robot adoption is so high, fueled by massive government subsidies, that if China and South Korea’s respective growth rates continue, by 2026 China will lead the world with the highest number of industrial robots as a share of industrial workers, when controlling for compensation levels. Robert Atkinson, ITIF’s President, has some sensible suggestions for how we can catch up. Policy makers should listen to him. This is not a piece about insurance or health care. It won’t make the cut for Health Wonk Review and it will probably cost us readers (Well, 15 years has been a pretty good run). What this piece is is one that addresses the health of our nation. Today, the Bureau of Labor Statistics (BLS) released a chart showing gains in productivity and hourly wages from Q3 2017 to Q3 2018. It looks remarkably similar to the chart BLS released at the end of Q2. Impressive Productivity and Output gains in both quarters. And, if you didn’t know better, you’d think Hourly Compensation is rising pretty well, too. However, look to the far right of both charts to see the change in Real Hourly Wages, which are wages after inflation is factored in. The Trump administration and most of the press have trumpeted (pun intended) the nominal wage increase of 2.8% for Nonfarm Business and 2.2% for Manufacturing in Q3, 3.2% and 2.5%, respectively, in Q2, without saying a thing about the negligible, and in some cases decreasing, Real Wages. Real Wages for Nonfarm Business during this one-year period (Q3 to Q3) are up a measly 0.1%, after rising an anemic 0.5% in Q2; Manufacturing Real Wages in Q3 are actually down 0.4% after being down 0.2% in Q2. And this is not a new phenomenon. In the 40 years since 1979, Real Wages for hourly and non-supervisory workers have increased by a total of only 4.5%. During that same period, the CPI has risen 247.7%. Since the day Donald Trump and his cronies got the keys to the kingdom, Real Wages per week have risen from $349 to $351 in constant 1982-1984 dollars. Two bucks! For the mathematically inclined among you, that’s an increase of 0.005%. During the same period, the Dow Jones average has grown 20.9%, and that counts the recent decline. I like the stock market as well as the next guy, but barely one-third of families in the bottom 50% of earners own stocks, according to the Federal Reserve. The fact is, lower-income Americans don’t have extra money to put into stocks, and a third of workers don’t have access to a 401(k) or another retirement plan, according to Pew. The facts make clear that since Republicans took control of everything, the economic gains have gone to the top earners. Folks in the middle and lower end have, to a large degree, been left by the wayside. Inequality reigns supreme. It is beyond baffling that these people who continue to get the smelly end of the stick resolutely remain, seemingly unperturbed, in the center of Mr. Trump’s base. Look at the enthused, smiling faces at his rallies. Sociologists have written about this, but I have yet to see anything that explains it fully. Regardless, tomorrow is Election Day. Many of us have already voted. Many more will exercise the option tomorrow. 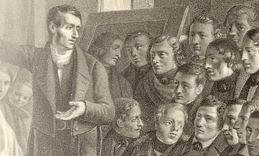 Predictions call for a large turnout, large being defined, God help us, as perhaps a little more than half. I’m now in my eighth decade, and I cannot recall a more consequential election. Many Americans (as well as some of my friends) are highly satisfied with the tax law changes, the rise in the stock market and the new makeup of the Supreme Court. In exchange for those they allow, without condemnation, the bullying behavior, the constant hyperbole, the ad hominem attacks and the non-stop lying. Perhaps it is fitting to end this non-insurance piece with the words John Adams wrote to his wife Abigail at the end of his first day residing in the yet-to-be-completed new White House in 1800. Franklin Roosevelt had the words engraved onto the mantel of the White House State Dining Room in 1945. Adams wrote, “May none but honest and wise men ever rule under this roof.” I wonder if the current occupant has ever seen those words. Catch up with he latest news and thinking on health care policy issues – Peggy Salvatore has a fresh Health Wonk Review July 2018: Summer’s Coming Around Again edition posted at Health System Ed blog. Topics range from opioids and Purdue Pharma to high deductible plans and the cost of end-of-life care – grab a coffee and check it out! NCCI has issued a new a new Insights report on Post-Traumatic Stress Disorder in Workers Compensation. Several states are currently exploring the issue of PTSD injury compensation – it comes up frequently for police, firefighters and other first responders. Speaking of trauma, if PTSD is on your radar, the New York Times reviews various books on how people recover from trauma, including one by Elizabeth Smart. See Adversity Needn’t Thwart or Define You. Here’s How to Cope. Work comp drug costs have dropped by over a billion dollars over the last eight years, largely driven by sharply lower opioid utilization. Learn more about this in the 15th annual Survey of Prescription Drug Management in Workers’ Comp via Joe Paduda, CompPharma. A new Lockton study says that nearly 70% of denied workers’ comp claims are converted and those claims can cost up to 50% more. 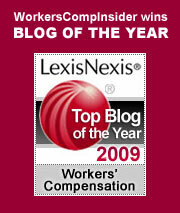 Top causes of high-dollar workers’ comp claims. Safety National recently completed a review of its largest workers’ comp claims and uncovered certain trends employers should be aware of. Cyber-Risk Costs Resist Overall Trend – Businesses’ total cost of risk declined in 2017, but cyber insurance rose 33%. Late Days of Empire Edition: Health Wonk Review. The wonks’ entries are reflecting the healthcare market chaos of the times – check it out! Also note that two weeks from today, we’ll be hosting the next edition here at Workers Comp Insider! Net neutrality & why you should care: If you are a blog afcianado – or if you just like a free an open internet, please make your voice heard about net neutraility. Don’t let the internet service providers do to the internet what cable companies did to TV – make your voice heard in favor of Net Neutrality which is at serious risk or being rescinded. See RIP net neutrality: FCC chair releases plan to deregulate ISPs. This requires immediate action: the vote is December 14. Make your voice heard. Purdue Pharma: In this weeks’s HWR, Joe Paduda talks about how Purdue Pharma is trying to limit legal liability in the many state suits. Related, there was an excellent recent article in Esquire by Christopher Glazek that is well worth a read: The Secretive Family Making Billions From the Opioid Crisis. Blankenship for Senate? – Convicted coal baron Don Blankenship announced his intention to challenge Joe Manchin for a senate seat in West Virginia. We’re talking about Don Blankenship who was CEO of Massey Energy Co. at the time of a 2010 Upper Big Branch mine disaster that killed 29 miners. We have opinions on Blankenship that we’ve expressed over the years. Hint: thumbs down for the senate. Grain Bin deaths: Over $1.8 Million in Proposed Fines Following Fatal Grain Dust Explosion – OSHA has proposed $1,837,861 in fines against Didion Milling Inc. following a May 2017 grain dust explosion that killed five workers and injured 12 others, including a 21-year-old employee who suffered a double leg amputation after being crushed by a railcar. We hope the fine will stick – see our prior post Walking down the grain – and the fines. Gripping read: Atul Gawande’s twitter pointed us to a remarkable story in Emergency Physician’s Monthly: How One Las Vegas ED Saved Hundreds of Lives After the Worst Mass Shooting in U.S. History. Hats off to the incredible medical teams! Nail salons: US nail salons: the challenge to protect workers from toxic chemicals – Critics mock an EPA scheme to create ‘healthy salons’, but Julia Carrie Wong hears how it is tackling an ‘epidemic’ of health problems from staff, many of whom are Vietnamese immigrants. Jennifer Christian posts Avoid “one-size-fits-all” thinking in evidence-based medicine, which challenges a blind spot in current thinking – worth a read. From our vantage, Dr. C is always in the forefront of new occ med thinking. Bionic safety? medGadget has news that Ford is trialing the Exoskeleton to help prevent worker injuries. The device is made by Ekso, a company that devlops full-body exoskeletons for paralyzed people, but the firm thins the technology can prevent injuries in workers who perform physically difficult repeat tasks, such as operating the overhead machinery. ADA lawsuit: Can you force an unstable employee to see a doctor? Here’s something all Americans can agree on: Health care costs way too much. But way too much in reference to what? Well, how about the rest of the developed world? How about wealthy countries, our peers, in the OECD, the Organization for Economic Cooperation and Development? The OECD was formed in 1961. Headquartered in Paris with a membership of 35 nations, the OECD’s mission is to promote policies that will improve the economic and social well-being of people around the world. Annually, it performs comparative analyses of issues affecting its members. One such issue is health care. Want to know about health care spending around the world, infant mortality, life expectancy, doctors and nurses per capita and a host of other health care topics? The OECD is the place to go. Which brings us to American health care, which I suggest is a classic paradox. On the one hand, on a per capita basis, we spend 41% more on health care than our wealthy nation peers in the OECD and 81% more than the entire 35-nation OECD average. As you can see, while our public funding (Medicare, Medicaid, etc) is comparable to many of the other 34 countries in the OECD, Germany, France and the UK for example, private funding in the US is more than 100% greater than Switzerland, our closest competitor, and 300% greater than the OECD average. This might be fine if we got what we paid for, but that is not the case. As an example, consider something that should be important to us all: life expectancy. In the US, life expectancy at birth is 78.8 years (76.3 for men; 81.2 for women). In the UK, it’s 81 (79.2 for men; 82.8 for women). In Japan, life expectancy at birth is a whopping 83.9 (80.8 for men; 87.1 for women). What about infant mortality, the number of deaths of children under one year of age, expressed per 1,000 live births? Our infant mortality rate of 6.1 is 45% higher than the UKs, at 4.2, and 265% higher than Japan’s 2.3 rate. Curious about obesity? Our obesity and overweight rate is exceeded only by New Zealand’s. And stop for a moment and consider cancer. Judging by the television ads, one would think the US has more cancer treatment centers than golf courses. Yet our death rate from cancer per 100,000 people is 188. Mexico’s is 115; Japan’s, 177. In fact, just about the only metric in which we lead the world is smoking cessation. So, yes, it’s paradoxical. Sort of like a big-market baseball team spending gazillions more for players than any other team, only to finish out of the running. And now, into the fray trots the Republican tax reform plan, which is looking more and more like it will actually become law. This plan would cause 13 million people to find health insurance unaffordable, which means their new PCP will be their old PCP, the local emergency room where costs are stratospherically higher than anywhere else. In addition, $25 billion will be cut from Medicare, which, although it’s only 4% of the total Medicare budget of $588 billion, can’t be good as more and more baby boomers age into Medicare. Fixing health care in America is going to take time and a lot more money, but we have to start somewhere, sometime. It’s hard to see where the Republican tax plan even approaches trying to do that. A fascinating article in today’s Daily Alert from the Harvard Business Review describes how our dependence on automation can erode cognitive ability to respond to emergencies. In “The Tragic Crash of Flight AF447 Shows the Unlikely but Catastrophic Consequences of Automation,” authors Nick Oliver, Thomas Calvard and Kristina Potocnik, professors and researchers at the University of Edinburgh Business School, report on their analysis of the horrific crash of Air France flight 447 in 2009. Their research, recently published in Organizational Science, describes in riveting detail the series of preventable cascading events that led to the deaths of all 228 passengers and crew. Although the crash of AF447 is a transportation tragedy, it also can serve as a stark reminder that employees who depend on technology, especially technology that controls dangerous work, say self-driving 18-wheel trucks, for example, need a lot of training to take the right steps when technology reacts to emergencies. Without that training, the authors contend, the cognitive ability to take manual control and successfully deal with the emergency is problematic at best. We are now at the beginning of a monumental shift in the way work (and play) is done. The natural gravitational movement of artificial intelligence assuming more and more control in our daily lives is unstoppable. Think of how it has brought tremendous improvements in air safety. To prove that, consider this astounding statistic: In 2016 the accident rate for major jets was just one major accident for every 2.56 million flights. But this bubble of safety can breed terrible complacency. How humanity deals with and prepares for the rude “automation surprises” that will surely come along on the way to the future should be a critical component in the thinking of organizational leaders and safety professionals.